The 2013 XTS is an all-wheel-drive Cadillac flagship built on the corporate Epsilon architecture. Cadillac’s introduction of its new XTS flagship sedan at the 2011 Los Angeles Auto Show provided the opportunity for General Motors Co. to unveil new technology that the company hopes will burnish Cadillac’s faded “Standard of the World” slogan. The XTS is based on a stretched Epsilon platform like that used for theBuick LaCrosse. Of particular note is the connection to the Opel Insignia OPC, an all-wheel-drive performance model, because the new Cadillac uses the same Haldex all-wheel-drive system, and like the OPC, the XTS is equipped with Brembo brakes as standard equipment. Under the hood, though, is a 300-hp (224-kW) 3.6-L V6 powerplant code-named LFX in place of the Buick’s turbocharged four-cylinder. The LFX features a plastic intake manifold that is 5.5 lb (2.5 kg) lighter than an aluminum manifold, and exhaust manifolds that are integrated into the aluminum head castings to save another 13 lb (5.9 kg) per engine compared to using separate parts. The transmission is GM’s Hydra-Matic 6T60 six-speed automatic with tap-shift control. The car rolls on standard 19-in wheels with 20-in units optional, mounted at the front to GM’s HiPer Strut modified MacPherson strut suspension seen previously on the Regal GS. Suspension movement is controlled byDelphi magnetic ride shock absorbers, with rear air suspension providing load-leveling capability. The bigger news for the XTS is the incorporation of abundant new technology, such as a leading-edge touch screen infotainment system and automatic braking “virtual bumper” technology. The Cadillac User Experience (CUE) is a capacitive touch screen system supporting Apple-style multitouch gestural input for motions such as swiping, pinching, and flicking. This will let smartphone and tablet computer users immediately feel at home using CUE. CUE also has a proximity sensor that detects when someone reaches toward the screen, so it keeps most of its buttons invisible most of the time, revealing them only when someone reaches for the display and presenting a cleaner, simpler appearance the rest of the time. CUE also borrows from Research In Motion’s Playbook, featuring haptic “click” feedback through the touch screen like the Blackberry Storm. That means that when pressing a virtual on-screen button, the driver feels a click from the screen confirming that the choice has been registered. It also gives the fingertip a bump as options scroll past, conveying the feeling of navigating down a list, with a double-bump at the end that gives the feeling of hitting the list’s bottom. In addition to the 8-in display in the center stack, the XTS has a 12.3-in reconfigurable LCD display panel in place of physical instruments. While the details are customizable, there are four basic themes to choose from that provide either abundant or minimal data, depending on the driver’s preference, and can mimic conventional circular analog dials if that is preferred. Like a dual-screen desktop computer display, information can be moved from one screen to the other as needed, but rather than using a desktop mouse the driver moves information with a simple swipe of the hand. 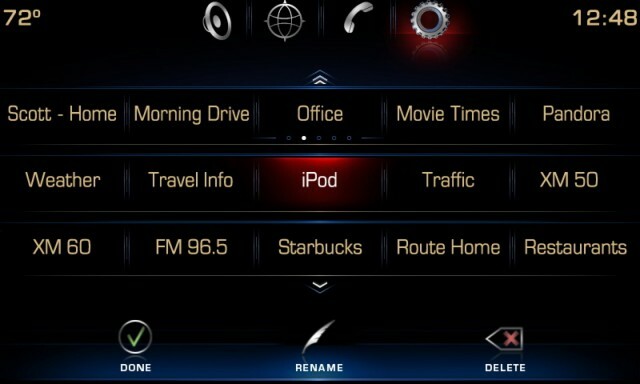 Another Apple-like aspect is a natural language voice command system that is similar in concept to the Siri system on the iPhone 4S. Natural language means that commands and requests can be formed like normal sentences, rather than the stilted menu-driven systems currently in use that require users to speak from an allowed vocabulary at each level of the menu structure. Users find this to be immensely frustrating, even when allowed words are listed. "With older systems, if I don't say those allowable words, the system doesn't respond," explained Jeff Massimilla, CUE program manager. All of this requires substantial processing power, provided here in the form of a three-core processor supplied by ARM Ltd. When a voice command is issued, two of the three cores are dedicated to processing that information for a quick response to natural language instructions, Massimilla said. That means drivers can request directions to a specific location, speaking the entire address at once, rather than having to list each part of the address when prompted by the system. Helping to augment some of the driver’s processing power, Cadillac installed forward and rearward radars that are connected to the XTS's brakes. In parking situations the XTS brakes itself before hitting objects. This will help when squeezing between two cars because the sensors have a bumper-level view of the surrounding cars. Anticipating that drivers could be frustrated if the car automatically brakes before they can get it into position, Cadillac engineers sought to whittle the margin of error down as much as possible, said Chief Engineer Sheri Hickok. After being annoyed by a conservative setting that wouldn't let the XTS prototype near other cars, she turned the sensitivity down to the minimum. "But the minimum gap would just let you scrape the other car," she recalled. So the production cars will hit showrooms with the sensitivity set to the minimum, plus a 30% safety margin. While the system can ease the headache of parallel parking in tight quarters, the real benefit is its ability to spot objects the driver can't see such as posts and kids’ bikes. "It can see where you can't," Hickok said. The same system also has “Automatic Collision Preparation.” If the radar detects an imminent collision on the highway, it applies the brakes at up to 1 g of deceleration to reduce the force of impact. Before that, when the computer sees a stopped or slow-moving car ahead, it will tap the brakes to alert the driver, with the aim of motivating them to action. But if the driver ignores the warning, the system will apply the full braking force to minimize the impact. Naturally the XTS has all the other usual safety features, such as blind-spot warning, lane-departure warning, rear cross-traffic alert, brake assist, and adaptive cruise control. An active system gives the driver a vibration on the side of the seat if any of these systems detect a threat, providing still more haptic feedback to the driver to improve communication between the XTS’s computers and its driver.